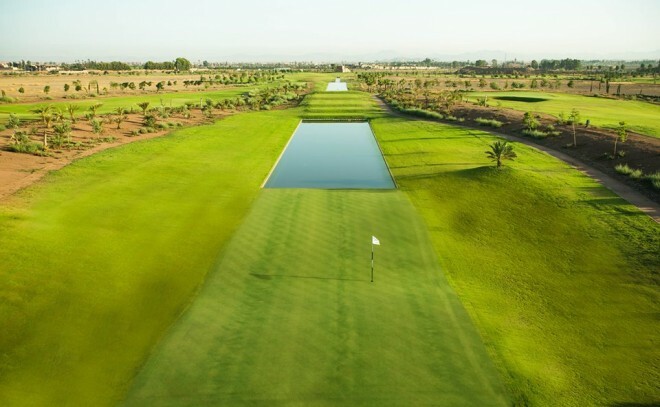 The Noria Golf Club is a unique golfing oasis at the foot of the Atlas mountains. The two Par-36, nine-hole loops, which are very well balanced in terms of length and difficulty, wind through olive orchards, lavender fields and desert landscapes before making a dynamic, parallel finish along a formal reflecting pool with the snow-capped Atlas Mountains and a dramatic, beautiful clubhouse providing a stunning backdrop. The concept of blending three different landscapes (orchards and lavender fields, the desert and a formal “oasis”) was challenging, yet provided the basis for a golf experience filled with wonderful variety for the player.